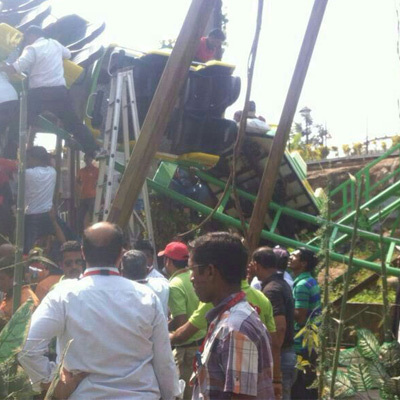 Yesterday, February 5th, the Bandits of Robin Hood coaster at the Adlabs Imagica theme park near Mumbai, India had a catastrophic failure. Two people are known to be injured from the incident, 32 year old Purnima Rathi and her 14 year old daughter. Purnima suffered an undisclosed head injury and her daughter some kind of injury to her jaw (details are a bit lacking). The coaster, less than a year old and built by Italy's I.E. Park, is what most of us in the US would call a "kiddie coaster". How exactly the back two cars of the train were able to derail is not a mystery to the media, coaster enthusiasts and riders themselves, but the park is at a loss as well. The ride is closed until further notice as they look into the cause of the accident and try to piece together what happened and how to prevent it from happening in the future. Hopefully Purnima and her daughter were not injured too badly and the cause of the accident is discovered and snuffed out before anything else like this happens. We here at InSanity lurks Inside hate to hear about accidents at theme parks and hope all will be well with park and especially the family involved.